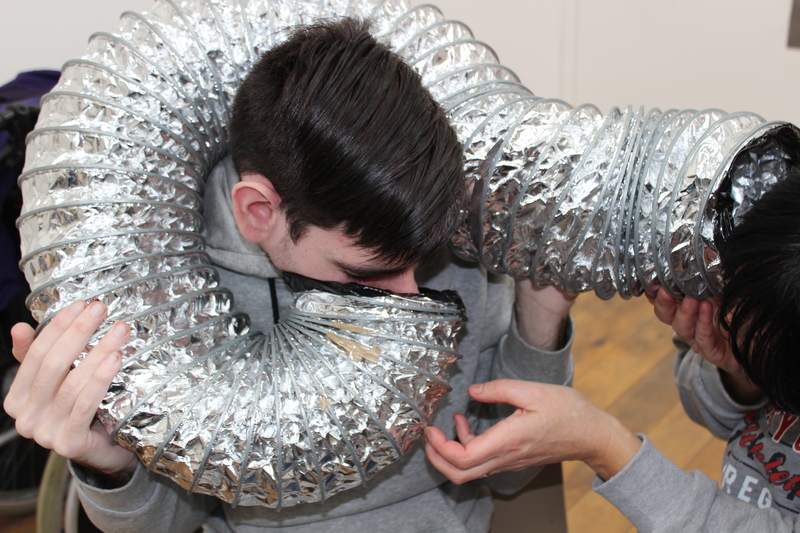 “Immersive Spaces” offers one to one and group workshop sessions aimed at young people – school leavers and adults with profound and multiple learning disabilities and autism to provide a stimulating creative environment and intense one to one engagement that will enable participants to continue to develop, learn and explore through the senses. Thanks to funding from ICF we have just completed a very successful pilot project at MOSTYN in Llandudno working with young people and adults with profound disabilities and autism to provide a sensory, stimulating and creative experience. Engaging with arts and culture. A report s available on request – if you are interested in being involved in Immersive Spaces in future as a venue, an artist a parent/carer, volunteer, organisation or as a participant then please contact me by e mail. I have had the pleasure to work with Bethany and her mum and dad quite a few times now over the last three years. Naomi at Mostyn has always found opportunities for workshop sessions in the gallery – additionally Bethany and her parents continue to use the workshop space themselves and to attend there events at the gallery as a family. Last time we met for a workshop session in April this year the family arrived looking very stressed – they had had a difficult night – not much sleep and a rough morning but they were determined not to miss the session! As the theme was the sea we painted and explored shells, seaweed and foam which we also used to paint with. We blew bubbles and then Jasmine – Bethany’s younger sister – her mum and dad made a boat each and painted them. When they left they were like a different family! A bit of space – together to do something creative and interactive made all of the difference. With immersive spaces I hope to be able to offer more families young people and adults the opportunity to be creative and interact through the senses.